With the growing amount of new Disney World restaurants and dining experiences opening their doors this year, I thought it’d be a great idea to share some pretty cool and interesting Disney World Food facts and info that Disney would never tell you. So with that being said, let’s jump straight to the Disney food facts! 1. You can’t buy gum anywhere at any of the Disney parks or resorts, including mini golf. 2. When you’re on the Dinosaur ride at Animal Kingdom, you’ll see 3 pipes with formulas on them downstairs in the queue area before you board the time rover. The pipes colored red, yellow, and white are labeled with the formulas for ketchup, mustard, and mayonnaise. 3. There are over 6,000 food items available at Walt Disney World, served at more that 475 different dining options throughout the property. 4. The only place that sells alcohol at Magic Kingdom is Be Our Guest Restaurant. The other parks all sell beer, spirits, wine, and cocktails. 5. Over 1.2 million turkey legs are sold throughout the parks. However, this number will soon lower as turkey legs are no longer available at Animal Kingdom. 6. The Land Pavilion at Epcot grows over 30 tons of vegetables and fruits every year, all of which are served at the restaurants throughout Disney World including Garden Grill. 7. Disney chefs will use at least 90 different cheeses in their cooking. Talk about variety! 8. Disney Harvest is a program that donates their food waste to the Second Harvest Food Bank of Central Florida to help end hunger in the Central Florida area. Plus Disney also pledges to donate upwards of 20,000 pounds of fresh produce to this organization every year. 9. Walt Disney World Resort would be the 45th largest food chain in the world if it became a food service company. 10. The Rose and Crown Restaurant and Pub in the UK Pavilion in Epcot is named after the two most common names found in pubs across the United Kingdom. 11. You will not find Pepsi at any of the Disney World properties, resorts, and theme parks. It’s a 100% Coca Cola resort. If you want Pepsi then you’re going to have to bring your own. 12. During the peak season or busy days, certain restaurant locations will open up to help accommodate the heavier crowds at the theme parks. One example is the Toluca Leg Turkey Co. that’s only open when Hollywood Studios is projected to have high attendance. 13. The Enchanted Tiki Room was supposed to be a restaurant, according to Walt’s original plans. 14. Over 3.5 million Mickey Premium Ice Cream Bars are sold every year. These ice cold treats are quite addicting, especially on hot and humid Central Florida days. 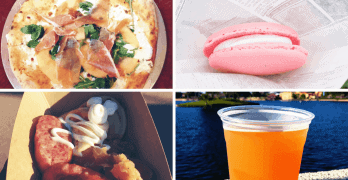 Thanks for reading about these pretty cool Disney World food facts. If you have any other cool ones that you’d love to share, please leave a comment below. P.S. Feel free to follow me on Instagram too!